The following is a partial listing of the periodicals available to members from the club library. A bi-monthly print publication and electronic publication available in six languages. This will be available in the library for a limited time only due to space concerns. A quarterly publication of the American Bonsai Society. This will be available in the library for a limited time only due to space concerns. The club has a nearly complete Bonsai Today collection. 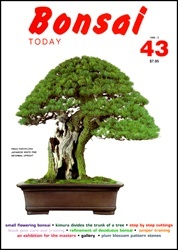 For years, Bonsai Today magazine was the premier English language bonsai magazine. Bonsai Today magazine is full of of the best bonsai trees and bonsai how-to & care. With contributions from Masahiko Kimura "the Magician" and other contemporary bonsai masters. Every issue contains clear, insightful instruction from the renowned Japanese magazine Kin Dai and western commentary on indoor and tropical bonsai. Bonsai Today is truly an invaluable resource for the bonsai enthusiast. An Excel spreadsheet index for issues 6 to 108 can be found on the "Nebari Bonsai" website here. A PDF index from Yarra Valley Bonsai Society can be found here. 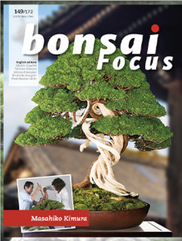 A quarterly publication of the Golden State Bonsai Federation which concentrates on bonsai in California. This will be available in the library for a limited time only due to space concerns. 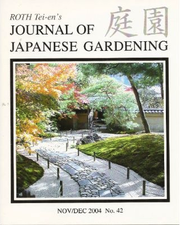 A bi-monthly English-language print publication dedicated to the special world of Japanese gardens and Japanese architecture. Every other month, this magazine discuses various aspects of Japanese architecture, horticulture, art, and philosophy. Topics range from centuries-old design principles to modern, how-to construction and maintenance techniques.